TORONTO, November 8, 2017 – MaRS Discovery District today announced a partnership with Greentown Labs, the largest cleantech incubator in the United States. As part of the partnership, the two organizations have agreed to help their respective cleantech ventures enter each other’s markets though introductions to local investors and potential partners and customers. MaRS in Toronto and Greentown in Somerville, Massachusetts, will offer each other’s ventures a “soft landing” by making temporary workspaces available where inbound entrepreneurs can interact with peers and learn more about the local market before deciding to establish a permanent presence. MaRS and Greentown also plan to hold joint events that showcase the technologies of their cleantech ventures to corporate and venture capital communities in the northeast United States. This collaboration is one of several that MaRS has established in the region to help Canadian cleantech ventures boost export opportunities to the US. On November 1, MaRS announced a comprehensive partnership with Grand Central Tech (GCT), the largest innovation hub in New York City. GCT serves as an extension of the expert support and services that MaRS offers to Canadian entrepreneurs out of Toronto, and also offers temporary workspace to MaRS Growth and Scale stage ventures looking for a physical site in NYC. Earlier this year, MaRS partnered with ACRE, a clean energy incubator operating out of the Urban Future Lab at New York University. Like Greentown Labs, ACRE is helping Canadian cleantech ventures navigate the NYC ecosystem and make the right connections with investors and partners. Greentown Labs and ACRE are both part of the Incubatenergy Network, a national network of mostly U.S.-based cleantech incubators focused on accelerating the transition to a sustainable future by supporting more than 500 cleantech startups around the country. 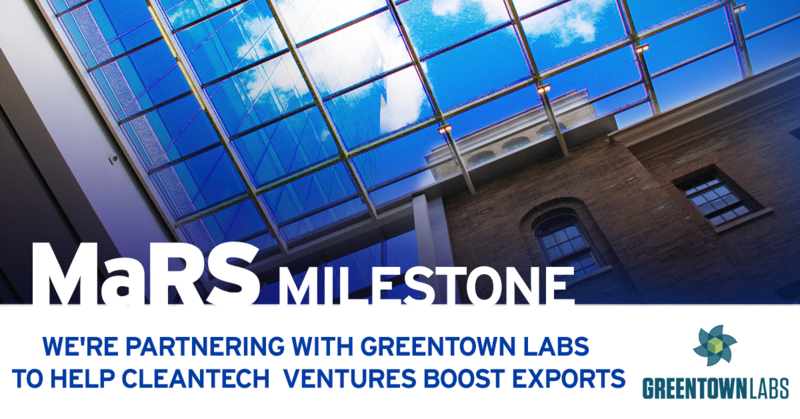 Greentown Labs has supported over 120 companies since its inception. These companies have raised US$260 million in funding. MaRS works with hundreds of high-growth cleantech ventures that are addressing a range of complex global challenges—from improving energy storage, generation and distribution to defining the future of transportation. These companies raised $210 million in funding in 2016 alone.